Coraline is based on the book of the same name by Neil Gaiman. The movie theatre I saw it in was only 2-D, not 3-D; I'm hoping to be able to watch and enjoy the 3-D version. The movie is animated stop action, and it's a thing of beauty. Great colors, wonderful scenery, it's just an amazing work of art. The OtherMother is deliciously creepy, especially when she's imitating a child's version of what a Perfect Mother would be. I'm usually quite easy about books that have been turned into movies. No, really. I understand that what works well in a book doesn't work well in a movie; and that to tell a story visually requires change. I also understand the need to cut (or expand) a story to make it fit a movie format. That said, ultimately, I was disappointed by how the story was adapted into film. The movie introduced a friend for Coraline called Wybie; and while this lessened Coraline's isolation (an important part of the book), it did give Coraline someone to talk to and interact with. The book has long stretches where it is just Coraline and her thoughts; having a person there, instead of just Coraline, makes sense. So I understand why Wybie was added. What doesn't make sense is that Coraline, while spunky, is dumbed down. And part of that dumbing down shows at the end, when Wybie (the boy) rescues Coraline. Coraline's well-plotted defeat of Other Mother gets turned into a spur of the moment event that requires The Boy to help save the day. OtherMother and her OtherWorld are wonderfully realized; but it's exaggerated a bit too much, such as putting the retired actresses (Miss Spink and Miss Forcible) into stripperesque costumes. This is a don't-miss visual experience; but in terms of story-telling, the book remains far superior and has a much more appealing Coraline. In all seriousness, I would be truly grateful for actual democracy in China, but today I'm tongue-in-cheekily grateful for the release of Guns n' Roses' looooooong-anticipated album, Chinese Democracy. Hipsters who love GnR in a semi-closeted, ironic way; metal fans; and 1980s nostalgics alike can now breathe a sigh of relief as the great opus from W. Axl Rose and company is released to conflicting critical assessments (Jon Pareles is disappointed; David Fricke is enraptured; Pitchfork has not yet weighed in) and free Dr. Pepper, (today only -- bizzarely, the coupon makes no mention of the album tie-in, though it was kind of a big deal a few months ago) through Best Buy only. Which makes me wonder: how are libraries going to get this album on the shelves for their patrons? Will Best Buy accept Purchase Orders? Of course, Best Buy & libraries may be utterly beside the point, as Chinese Democracy has logged over 3 million listens on MySpace Music to date, making it the the site's most listened-to album ever. I also have to wonder if all those listens will translate to similarly huge sales, and if they'll be enough to launch a tour (which would be considerably more lucrative than album sales), and if they do, if Rose will be mentally up to such an endeavor. 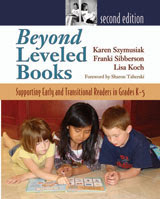 Beyond Leveled Books: Supporting Early and Transitional Readers in Grades k-5 by Karen Szymusiak, Franki Sibberson, and Lisa Koch; foreword by Sharon Taberski. Stenhouse Publishers. 2008. Copy provided by author. A few months back, there was a conversation on Yalsa-Bk about reading levels. I had a couple of questions, so did what people usually do; turned to friends who are experts, Franki Sibberson and Mary Lee Hahn of A Year of Reading. In addition to answering my questions, I found out about Franki's new book, Beyond Leveled Books, and Franki kindly sent me a review copy. In the foreword, Sharon Taberski says, "Leveling does have a place in our classrooms - a practical one. It can help match a child with a range of books he's likely to be able to read on his own and during guided reading, and it can play an important role in helping struggling readers become more proficient. . . . [T]here's a lot more to teaching children to read than finding their levels and moving them upward. Children need to plateau in their reading. They need to consolidate their skills and strategies, to read widely and deeply, to increase their vocabulary, and to experience life and gain humor so that they have more knowledge and insight to bring to texts and consequently understand them better." Libraries have books. And librarians. And librarians are very good at matching a book to a reader. But what we don't learn in library school is how to teach reading or how reading is taught. Which means when a kid comes in looking for a book, it's great. But when a parent (or teacher) comes in asking for level this or that, it's a blank, because for us it's about the book, not the level. Beyond Leveled Books is also about the book, not the level. Aimed at teachers, it is a must read for librarians. While showing teachers why it is good to go beyond leveled books, it also works as a great primer as to what is a leveled book and how reading is being taught in the classroom. Yes, as public librarians we focus on the book; but it's also good to know what is going on in the child's classroom. I'd further suggest it to parents who are trying to understand what is going on in their child's classroom and what is happening with their child's reading skills and how those skills are much more than a "level." What about comprehension, understanding what is going on in the book, etc? The authors and other contributors, all classroom teachers, explain some of the "critical needs" of their students, using examples, including how and when an adult can help the student meet those needs. The parent who complains about a teacher using picture books or graphic novels, or who doesn't use books grades above the child's grade, needs to read this book to understand better how reading is much more involved than learning how to read words. The book is full of articles, reading lists, lesson plans, and suggestions to address a child's reading as something much more than a vocabulary level. Over and over, I found examples and illustrations of reading being more than words. When a child reads "right" in a sentence, do they understand they are being directed to look at a photo to the right of the text? Or do they think the author is saying "right!" How does a child learn about the use of flashbacks in a text? I especially liked the ideas of grouping books by authors, characters, genres, series -- a wide assortment of ways that kids can find the book they want, rather than obsessing about what level they (and their classmates) are at. These suggestions for classroom libraries can easily be used in public libraries, for displays and booklists. The chapter on series books is perhaps my favorite, because I read them as a kid and read the grown up versions now (Nora Roberts is my comfort read). The authors address one of my pet peeves about levels and reading above levels. When books are viewed as simply the sum of their vocabulary words, kids are given books above their age level that are best left for a few years down the road. The example in the book is The Giver, with a well-meaning teacher using this book with third graders. (While the book uses all school examples of this "reading up", I also see it happen with parents and relatives selecting books for kids). The teacher writing about this notes, "I understand the importance of giving children books to read that support their growth and development as readers. They won't make progress as readers if they read only easy books. However, there are better options for young advanced readers than young-adult books. Teachers need to look at more than the readability level of the book when book selections." She then notes that the theme of the book is just as important, if not more so, than vocabulary. When children are pushed into books that are above their comprehension, the result is books they won't reread once they do have "the life experience, cognitive development, and emotional maturity to truly comprehend the book." They also miss out on the books they missed in the hurry to rush them into older books. Stories about reading include the authors mentioning their own children and their students. I am very thankful that in doing this, the authors presented a variety of types of kids and readers; there is no "this is how I raised a reading genius and so can you." Instead, this is about teaching reading, and teaching a love of reading, with a huge emphasis on how reading is more than just vocabulary and grammar. As Franki wisely reminded me in a comment to a post of mine at Tea Cozy, "I have worked with lots of kids over the years who really struggle with reading and it is hard to love something if it is never easy enough to enjoy--thus the teaching how to read being essential. It is the teacher's/librarian's job to know books and kids well so that a child can find books they love--and books they can read. They go through the motions, and say they love lots of books, but when you talk more, they never actually finish the books or they've not understood the book. So, for me, it is a combination of the two--always." Looking for how that combination works? Read this book. Even if you were not an avid Diana-watcher since her marriage to Prince Charles, and even if you did not get up at some ungodly hour in September, 1997 to watch many hours of her funeral coverage, you may still want to read The Diana Chronicles. Tina Brown, whose journalistic star's ascendance, as editor-in-chief of Tatler mirrored (indeed, was fueled by) her subject's own meteoric rise to fame, certainly knows Diana well, and has done her research. Sadly, it's not a wholly satisfying read. Well, how could it be? We all know the terrible end Diana met, and her inability (refusal?) to get past her neediness and her taste for exactly the wrong sort of man is wearisome and repetitive. Maybe she would have gotten it right in her lovelife eventually, but of course, we'll never know. Some of what's here is fascinating: Diana's heartbreaking background as a child of a particularly nasty divorce, the utter failure of her parents to secure anything resembling a good education for her (has this book ever put the lie to the notion that a boarding school education is by definition a good one -- damn! ), her brilliance at public relations. I also found Brown's portrait of the Royal Family surprisingly sympathetic: I no longer hate Prince Philip, and I view Prince Charles as both heroic (in his environmentalist views & practices) and pathetic (in his romantic misadventures). I found myself unable to finish the book (and not just because there are close to 30 holds on it at my library), mostly because I just couldn't bear to read about one more disastrous love affair, about how she & Charles kept knifing each other in the back -- there could have been real love there, and they both squandered the opportunity -- and because I couldn't bring myself to read the end of the book, where Diana's death left her two boys motherless. Tina Jordan's review in EW found Brown's tone shrewish and catty, but I saw none of it. This is a clear-eyed account of what made Diana tick, and on that level, it succeeds admirably. I know this is by no means a ground-shattering review -- libraries that were going to buy this book have already got it flying off their shelves -- but it's what I've been reading while I wait for Mr. Potter, and I wanted to share. ETA: there were some annoying typos, too -- Brown refers to the great house in Rebecca as "Mandalay", when it's "Manderley", and mixes up the villains in two Jane Austen novels. Tsk, tsk. Follow up to my post, No Blogging For Committee Members, which reported a Midwinter rumor about ALSC Book Award Committee members not being allowed to blog. Hot off the presses, School Library Journal breaks the story and the resolution in Should Members of Book Award Committees Be Allowed to Blog? The short answer: YES. Read the full article for the history of the debate and the resolution. Note that bloggers still have to abide by confidentiality requirements, which makes sense; the concern had been that there would be a "confidentiality plus" standard for bloggers that meant either no blogging, or not allowing on blogs what is allowed in the "real world" and in print. A giant "you rock, Dude" to The Horn Book Editor In Chief, Roger Sutton, who blogs at Read Roger. The SLJ article reports that "Sutton, who’s currently on the 2008 Caldecott committee, threatened to resign after he was told to refrain from blogging about books that were eligible for an award committee. “I said if they do this, I’d quit the Caldecott committee, and that I would not put up with this gag.” Read Roger's own take on the dispute.